As a kid, I never really understood the excitement of Easter. I wasn’t into egg hunts or chocolate-shaped bunnies. The church I went to had special programs for the Christmas holiday, but Easter was more or less just another Sunday. We all wondered how Mel Gibson would portray Jesus in the movie. Would it be accurate? Would it be well done? Would it bring people to Christ? Well, having seen the film, I would say “yes, yes, and very likely, yes”. And that is the amazing power of redemption. The action of regaining or gaining possession of something in exchange for payment, or clearing a debt (as defined by Oxford Dictionaries). Jesus exchanged his life for ours. 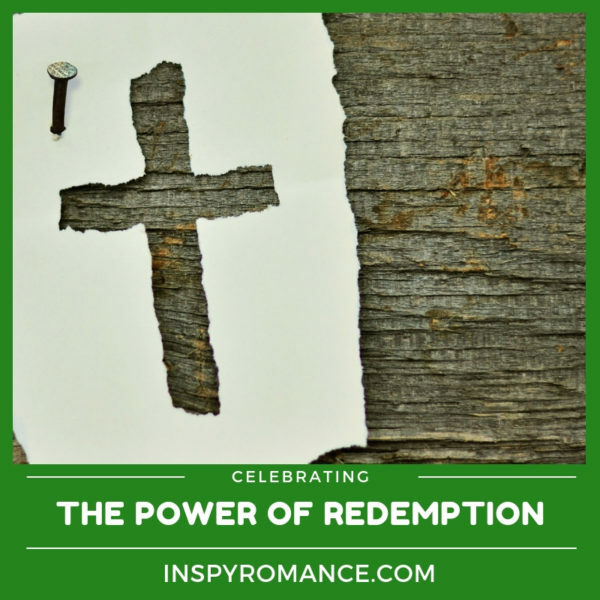 Why am I sharing about redemption today? Well, partly because this month we celebrate Good Friday and Easter Sunday, two amazing evidences of redemption. Also, because I have a new book releasing on the 9th that is all about the power of redemption. Here’s the cover reveal for Lawfully Cherished. As you can see, both of the characters in Lawfully Cherished have pasts that need healing. Add their current problems to the mix, and the situation gets a lot trickier. But this is a story about redemption, remember? I made sure to give them both the ending—and hope and healing—they need. Lawfully Cherished is available for pre-order. Get your Kindle copy HERE for only 99¢ for a limited time! How have you seen God’s redeeming power at work? Please share in the comments below. I’d love to hear your stories. I hope you have blessed Easter celebrating the power of God’s redemption in your life! Hi Liwen, I have been listening to Andrew Peterson’s Resurrection Letters: Prologue album and it is such a beautiful reminder of why we have Easter. I think God’s redeeming power is at work when I look at the way He has and continues to guide my life’s path. I have certainly heard big, powerful testimonies of dramatic life transformations and while these are amazing and wonderful, I believe that it is sometimes easy to overlook the ways that God redeems us from ourselves- the quieter ways, like crafting patience in a person for example. That is not natural- that comes from God. Hi Wemble! I couldn’t agree with you more about patience not being natural. I’ve learned that lesson well as a parent. ;) I do love how you put it—God redeeming us from ourselves in the quieter ways. That is certainly a daily process. Thank you so much for sharing your thoughts! Its interesting here Good Friday is one of the most important times in the Church Calendar along with Christmas. Its a public holiday and many people who are only nominal Christians will attend a Good Friday service. I had a friend say Easter Sunday is the most important day and yes its important as its when we Celebrated Jesus rising again but that couldn’t happen without Good Friday when he died on the Cross. Normally a week before Easter the Town Choir have an Easter Cantata. Not sure about a redeeming story. In Canada, too, Good Friday is a statutory holiday, so a lot of people have the day off work. To the vast majority it’s just an extra day off, which they appreciate only for the downtime. People who go to church very occasionally might attend Christmas morning and Easter morning. Valerie here most have a Good Friday service around 9 am or 9.30am. (Our church has morning tea with hot cross buns). Monday is also a public holiday. Liwen, My friend couldn’t work out why we would have a day off for Good Friday when to her thinking Easter Sunday is the day to celebrate. It was when I talked about how we go to remember the death of Jesus and what he did for us so we could then celebrate his resurrection she suddenly saw it in a totally new light. We didn’t have easter bunny in my family but on Good Friday mum and dad would give us (sometimes hide them) a large egg and as we got a bit older we were given an amount we could spend on eggs or chocolate and we learnt to buy a block of chocolate gave you way more chocolate then we would get it on the Friday. It was to not associate the chocolate with Easter Sunday but to remember the real reason for Easter. Hi Ausjenny! I couldn’t agree with you more. We wouldn’t have a reason to celebrate Easter Sunday if it weren’t for Good Friday. The Easter Cantata sounds lovely. Thanks for sharing! Hi Liwen! Thanks for a timely thought provoking blog. As a German, we celebrated Good Friday and Easter both at home and in church. Good Friday was a meatless day in our German household. In the evening, several churches had a combined reflective Good Friday service. Easter was a joyous occasion. The morning at home began with looking for our Easter basket. We always had a new outfit for Easter. Then off to Sunrise service and breakfast at church. Some years our church had a very cold sunrise service on the beach. During worship time – some years it was an Easter cantata, other years a play. Easter prep at church began in January. One year our Sunday School prepared for Easter by studying Don M. Aycock’s book Eight Days That Changed the World (published 1997 and no longer in print). It was a reflective scriptural look at Christ’s life from Palm Sunday to Easter Sunday. My parents survived WW2 and in our church God’s redeeming power as at work. Best wishes on your new release. It is on preorder. Blessings. Enjoy your weekend. Hi Renate! Wow, I bet the sunrise service on the beach was beautiful. I love hearing about all the traditions your family had for Good Friday and Easter. Thanks for sharing! Thank you also for preordering the book! I love Easter time. In my family we start with Good Friday. We usually have a quiet day with no music, no tv, no eletronic devices, light food (no red meat), just a time of reflection. (In Brazil most people used to stay indoors for that day and everything was closed growing up, but now stores are opened and there’s little rest.) Whenver possible, we attend service, but there’s very little talk before/after and usually find time to read about the cross around 3pm. Then Saturday is a day of preparation for a party and Sunday is usually a festive family event. I liked visiting cousins, grandparents, etc. Hi Priscila! What a wonderful time of reflection for you and your family. Thanks so much for sharing! Congrats on your new book. It looks amazing. Such a wonderfully powerful post today. I have been privileged to see Christs redemption in others lives. To watch them grow and share with others. Not something I take lightly. Hi Lori! That’s awesome and yes, such a privilege to witness. Thanks for sharing!